Secret Cinema, which held its first event in 2007 with a screening of Gus Van Sant’s Paranoid Park (2007) in a disused railway tunnel, delivers live, immersive, and participatory cinema-going experiences in London. In its original format, audience members would purchase a ticket without knowing what the screening was going to be, and would then be required to make preparations before attending the event. For example, for Casablanca (Michael Curtiz, USA, 1942) audience members were provided with identification papers and instructions on what to wear, and then on arrival at the event were subjected to an ‘experience’ in which the film was literalised in a location, both prior to the screening in order to set the scene for the film, and then throughout the film viewing experience itself. Other notable Secret Cinema events have included a 2012 screening of The Shawshank Redemption (Frank Darabont1994), which attracted over 13,500 people. For this particular event, audience members were summoned to a court hearing and instructed to wear long johns. Upon arrival at Bethnal Green Library, audience members were individually sentenced before being transported in buses with blacked-out windows to a disused school where they were stripped of their belongings and entered into the world of a prison as inmates. Closely aligned to physical immersive theatre experiences, such as the promenade theatre of Punch Drunk (2000–) and the on-street installations of Blast Theory (1991–), these original Secret Cinema “in-film” experiences have been described by Ed Potton as “combining film-going with the visceral anarchy of site-specific theatre and the clandestine thrills of an illegal rave”. More recently, events have been delivered for new releases, acting as a promotional mechanism embedded into the film’s marketing strategy. Prometheus (Ridley Scott, USA/UK, 2012) was the first new release that Secret Cinema screened, with the film making more money as a Secret Cinema event than on its opening night in London. Similarly, the number one box office position of The Grand Budapest Hotel (Wes Anderson, 2014) was largely attributable to the £1.1m generated by Secret Cinema, thus heralding the film industry’s recognition of the influence and revenue generation opportunities that are presented by this new and highly profitable event-led distribution model. These commercial successes mark a notable shift in both the organisation’s approach and the type of audiences that they are starting to attract. The events, which have previously been marketed in a clandestine way via word of mouth and social media in which knowing participants are instructed to “tell no one”, are now being launched through high-profile press releases. The organisation has now rebranded these different modes of experience as Secret Cinema Presents…, building on a known film and are advertised in this manner, such as 2014 screening of Back to the Future (Robert Zemeckis, 1985) which constitutes the focus of this article, and more recently a 2015 screening of Star Wars: Episode V – The Empire Strikes Back (Irvin Kershner, 1980). This has inevitably led to tensions between the expectations of an early adopter ‘hipster’ elite (those who attended the initial Secret Cinema screenings) and the much broader public of Secret Cinema Presents…, including Back to the Future fans, affectionados and aficionados, who are the focus of this article. 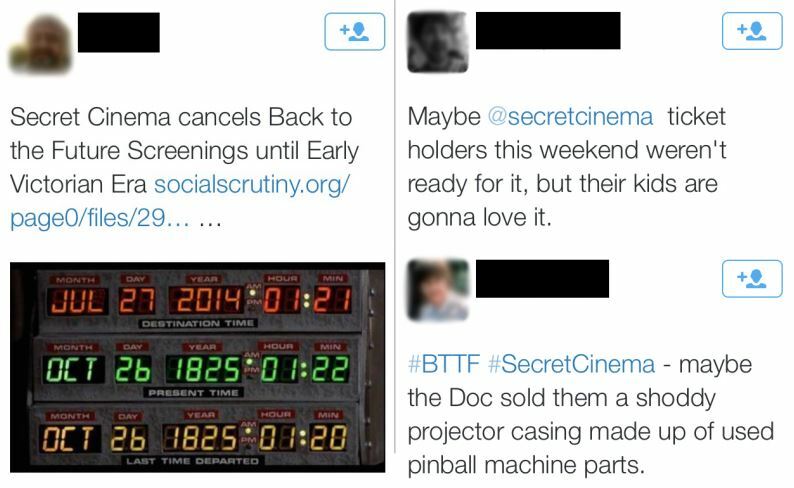 During the build-up to the Secret Cinema Presents… Back to the Future event, a compelling conflict played out on social media between the creators and the audience. In this article we retell the story of how that drama unfolded in the lead-up to the opening night of the event, and how the surrounding social media communications became a site of audience engagement and participation. We also outline the way in which these channels made visible a proliferation of divergent fan and anti-fan practices and contested viewing pleasures. The Back to the Future event was unprecedented in many ways: the venue had the capacity for 3,000 audience members, all of whom were willing to pay £50 for a ticket. Over the months of July and August 2014, 45,000, tickets were sold in total, generating a final box office gross of £3.37m – all for a film that is 30 years old. The build-up began – as does that of all Secret Cinema experiences – via online social media channels weeks before the live event itself, and it is these online spaces (as opposed to the event itself) that are the key site of our analysis. Crucially, it is these spaces that both the audience members and the organisation sought to shape, control and influence in contradictory and conflicting ways. This article illuminates the conflicts, tensions and re-negotiations of control embedded in both the experience and surrounding fan and anti-fan discourses, in which the event and the organisation were dismantled in public view, and we argue that the audience reclaimed both the social media spaces and the filmic text of Back to the Future as their own. The Back to the Future experience was to operate under the same ‘secret’ rubric as all the preceding Secret Cinema events – whereby participants are playfully instructed to “tell no one”, the location of the screening event is withheld until the very last minute, and cameras, phones and recording devices are surrendered at the door. This event also spawned an unprecedented extension of the film’s storyworld into these online spaces. Back to the Future’s fictional Hill Valley town and community were recreated on numerous in-fiction websites as well as in the physical spaces of Hill Valley ‘pop-up’ stores that opened up in East London in the weeks leading up to the main event, in which visitors were greeted and served ‘in character’ by actors playing Hill Valley residents. The film’s famous time-travelling DeLorean also made several appearances at various sites across London along with Secret Cinema actors dressed as Doc Brown and Marty McFly. Articles were frequently published both online and in physical newspapers, leading up to the Hill Valley fair (the proposed context of the physical event), and a Hill Valley TV station, HV-TV, started broadcasting on YouTube. Facilitated by the increased revenue generated by ticket sales, these elaborations and embellishments of the fictional world went above and beyond previous Secret Cinema events and were aimed at making the shows increasingly interactive and immersive based on audience demand. 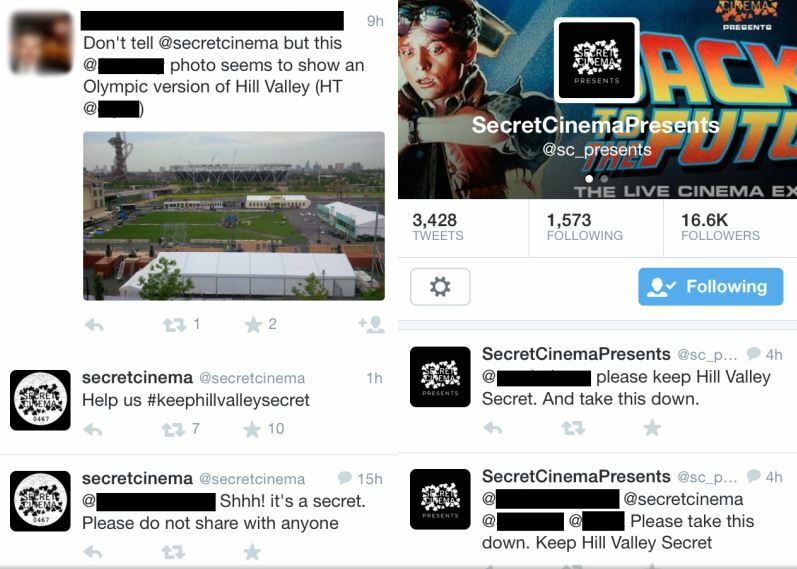 As part of the ‘fictional’ social media strategy, the Hill Valley website required ticket-holders to log in using an access code that was sent in an email prior to the event. Audience members were assigned a new identity and issued with a set of printable business cards, which they were instructed to bring along, and which contained their new name, address and telephone number, as well as an assignation to one of the Hill Valley community’s nineteen organizations. Audience members were then given specific instructions regarding what to wear and what to bring to the event dependent on their organisation. For example, Hill Valley High School students were required to bring their homework, photographs of family members and of favourite movie stars (at the event students could then decorate their own locker in the school building). Town Hall staff members, meanwhile, were asked to bring a commemorative flower wreath as well as banners, flags, posters and rosettes to support the Mayor Red Thomas re-election campaign. Those assigned to the Twin Pines Ranch were asked to bring homemade produce such as honey, taffy, flower crowns and knitted socks. And the Texaco garage participants were instructed to bring a chamois leather to “polish the cars to perfection” and to learn the Texaco song and dance (as presented in advance on the HV-TV YouTube channel). Accessing these online activities and content enabled audience members to engage with the fabric of the Back to the Future filmic universe. These activities also worked on the level of introducing new characters to the audience, who didn’t necessarily feature in the film, but who offered diegetic extensions of the fabula of Back to the Future. For example hairdressers, shopkeepers and garage attendants had features on the website giving them a significance far beyond that of the film. They also enabled audience members to contribute to the textual spaces of the experience. 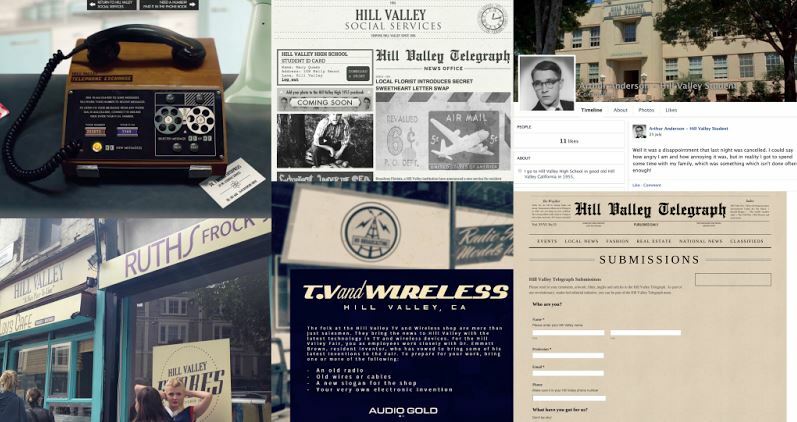 On the Hill Valley Telegraph staff page, members were asked to write one or more brand new articles on recent news or the latest report for the gossip pages, which in some cases were included on the event’s dedicated website. At Hill Valley Stationers, audience members were asked to create poster designs for the Hill Valley Fair and for all trading Hill Valley Stores, which could then be printed onsite at the stationery store and purchased (for real-world pound sterling). The online pre-event offer also included the introduction of an in-fiction communications channel, the Hill Valley telephone exchange, for which audience members were assigned their own unique telephone number and PIN, and were encouraged to leave and access telephone messages for one another. The answering-machine system also included access to a number of ‘set pieces’ from famous Hill Valley residents, including Emmet Brown, Lorraine Baines, George McFly, and Biff Tannen. The interface also enabled access to the 1955 Hill Valley phone book, in which all audience member identities were listed with a telephone number (this was also accessible on-site in physical print form). Audience members were also provided with instructions on the most appropriate clothing to wear through the link to a downloadable Hill Valley ‘Look Book’. These preparations enabled audience members to occupy the physical space of the narrative diegesis of the Hill Valley fair and to engage in events and activities outside of the filmic narrative. This created an intra-diegetic play space in which audience members took on a role through their embodiment of in-world characters and immersed themselves in the fabula world created in these online spaces (see Figure 1). Figure 1: Examples of the different diegetic spaces that Secret Cinema created both online and in the real world – The Hill Valley Stores – a pop-up shop and café opened in East London for the duration of the event – participants could buy clothes in preparation for the event and have their hair cut in the salon. The Back to the Future event began its life using the same methods and infrastructure that had been deployed in previous campaigns, and which are/were characteristic of an independent organisation. However, this infrastructure proved insufficient for coping with audience demand, and within ten minutes of the hotly-anticipated tickets being released for sale the ticket provider’s servers crashed and no one was able to purchase tickets. 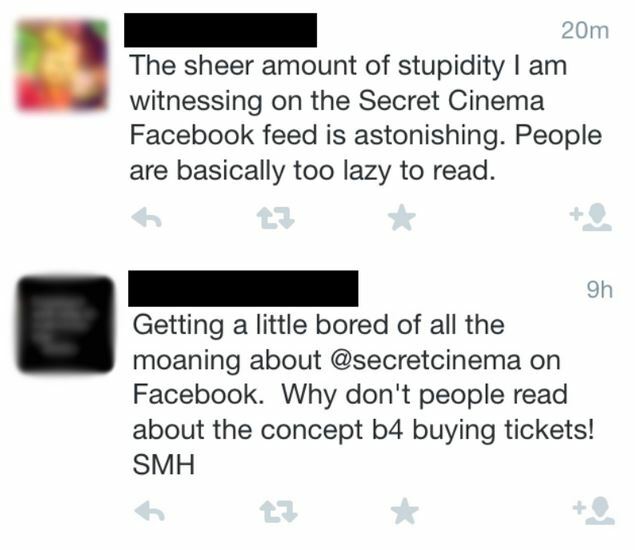 Although the tickets were then re-released two days later with a new, larger, shinier and well-known provider, customer anger nonetheless quickly bubbled up through the social media channels, with comments regularly relating to the film text (for example, about the organiser’s being able to travel back in time to sort out the problem – and needing 1.21 giga-watts of power, the amount needed in the film to send the DeLorean back in time, to fix their servers). This anger quickly subsided when customers were able to secure tickets, with more screening dates being announced to cope with the high demand. In the following weeks, email communications started to flow from Hill Valley. These were multiple, detailed and frequently confusing. Real-world instructions were buried in in-world fictional links, and dense (fictional) textual detail about Hill Valley Town Fair confused and frustrated the recipients. 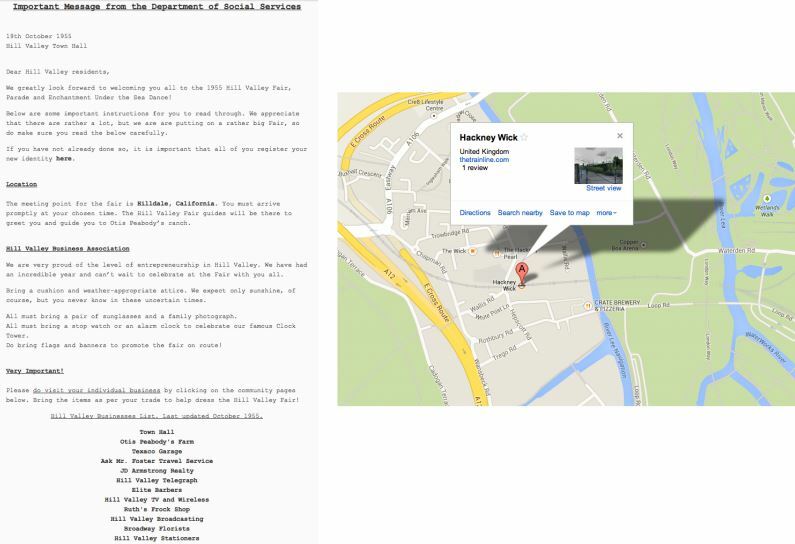 For example, the long awaited link to the map showing the event location was a hyperlink buried in an email communication. Ticket holders reported that this link did not work in all browsers, nor was it immediately evident that there was a significant link in the text. Secret Cinema’s Twitter and Facebook sites were used to loudly bemoan the lack of clarity and to demand practical information such as transport links and nearby accommodation (see Figure 2). This was not a local, London-based, hipster audience but one drawn from all over the UK, Europe and even further afield. Figure 2: Illustrative participant complaints delivered via Twitter. A dichotomy quickly emerged as Secret Cinema used these online spaces to allow audience narrative engagement whilst also deploying these same sites to administer marketing, selling and instructions for their audience in key preparations required for the event. They also heavily policed these spaces – issuing requests for audience-generated content to be taken down. A confusing communications strategy, which interchanged between fiction and non-fiction registers, manifested – of the sort that Andrea Phillips would describe as a “badly-drawn play space.” For Phillips, such a space is one in which the rules of engagement for participants and the required playful behaviours are poorly delineated and/or badly communicated. Participants were addressed across a number of confusing and potentially conflicting registers: as knowing ‘players’ of Secret Cinema experiences; as devoted fans of Back to the Future; as customers to be provided with precise and demanding ‘joining’ instructions; and, frequently enough, as unruly bodies to be controlled through orders and commands. In the examples given in Figure 3, we can already see the extent to which assumptions of audience technicity (their adoption of and familiarity with specific technologies, as well as their tastes) governed the dissemination of information. Embedding links in emails and assuming a certain technoliteracy is just one key example, making it easy for many to miss critical information and thus producing a confused flurry of tweets and Facebook postings asking for clarification. Figure 3 also shows the secret location on Google Maps – hidden behind the ‘Hilldale, California’ link within the email text. There were of course many other assumptions around taste and disposable income that played in to the participant discontent as time progressed. The organisers, who clearly wanted to establish audience relations in what Henry Jenkins describes as “collaborationist” mode, did not appear to appreciate the complexity of operating across the “transmedia storytelling” register whilst also engaging with fans schooled in the use of social media for community building and personal display of textual expertise. At minimum, the organisers certainly played out a lot of channel confusion through a blurring between in-fiction storyworld elaboration and audience instruction. As this confusion took hold the struggle for ownership within the virtual space was swiftly apparent. The speed and reach of dissemination of discontent in the social media context was also very clearly a factor. 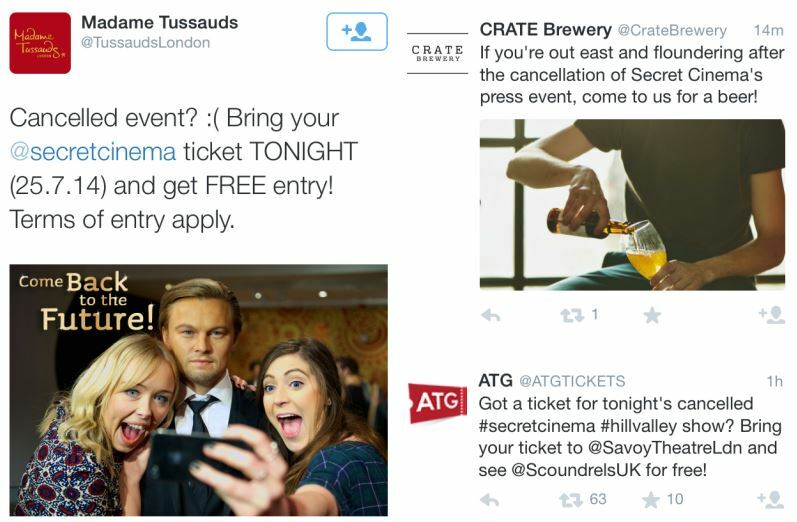 Figure 4 illustrates some of the numerous conflicts that played out as participants exposed details of the event’s location on Secret Cinema’s social media streams. This was the first time that a Secret Cinema Presents… event engaged with a pre-existing and well-formed fan community. Back to the Future has highly visible formal and informal fan communities, both of which have intensified their activities in the run-up to the film’s thirtieth anniversary in 2015. A key challenge that Secret Cinema faced was the expansion of their audience and a new diversity of participant subjectivities. In a study of engagements with the Lord of the Rings storyworld (across book, board game, video game and film), Jon Dovey and Helen W. Kennedy identified the complex interaction of fan tastes, technical competency and textual expertise in the display of fan subjectivities. In these conditions of intermediality our responses to such texts will crucially be dependent upon our technicity – that combination of taste and competence that determines our ability to access a storyworld as well as our individual style of interactions with it. Technicity can therefore be seen as a key marker of a subject’s ability to exercise the flexible repertoire of interpretive responses demanded by increasingly intermedial cultural landscapes. The online spaces detailed above allowed devoted fans of Back to the Future to display and celebrate their thorough knowledge of the characters, dialogue and narrative – even when critiquing or satirizing the event organisers/organisation. The critiques that emerged came along a number of different axes of participation. Many fans used the social media channels to display their virtuoso command of not just the film text but the communication channel itself as they made their criticisms very public. In Figure 4 we also see how one of the fundamental rules of Secret Cinema was broken: the Back to the Future unfinished location was repeatedly photographed and revealed in an act of ongoing defiance and exposure, an activity that can be aligned to the fannish behaviour of a “set tracker”, which according to David Brisbin, is the industry name given to fans who locate film sets to photograph and share with other fans in open displays of subcultural capital. 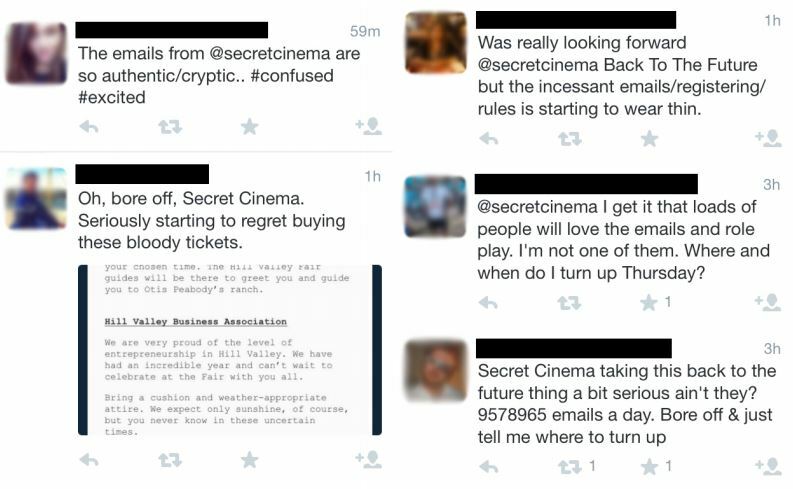 The conflict between Secret Cinema and its audience continued to manifest as Secret Cinema attempted openly to exert its control with cease-and-desist-type tweets couched in its playful “tell no one” language, which somewhat undermined their apparent collaborationist stance (again, see Figure 4 above). This attempt to reassert control was responded to quite differently depending on fan subjectivity, as we shall see below. Fan-to-fan conflict started to emerge at this stage between the core Secret Cinema audience and the newer Back to the Future contingent, a conflict that might also be characterised as being between devoted Back to the Future fans and newer Secret Cinema fans. There were many incidents in which Secret Cinema fans berated the newer fans for failure to read the instructions, to properly engage with the concept or understand the significance of the secrecy in relation to the overall experience. This further highlighted the ways in which these social media channels might need careful managing in relation to different kinds of fan address and fan subjectivities. In terms of the complexities of these audience subjectivities, we might want to signal at least two key axes of distinction here. The first is primarily about the engagement with the novelty of an immersive experience of any cinematic text. This, we might argue is the subjectivity occupied by the hipster elite/early adopter/technorati, who have been driving investment in ‘new’ or ‘novel’ experience design that expands our engagements with (and crucially our financial commitment to) a particular intellectual property (in this case a film). The second is aligned with the ‘collection’ and ‘completion’ of, as well as a deep engagement with, a particular story or text; this is the participant who will buy the book of and the ‘making of’ special, who will collect the merchandise, take the fairground ride, watch the reruns, play the board game and so on. What these latter fans share is the complex and profound commitment to a particular text or storyworld. These complexities and differences were clearly not well understood in the design of the Secret Cinema online communication strategy. The growing dissatisfaction and annoyance is illustrated in Figure 5, in which we see how comments continued to be met with criticism and disdain by the Secret Cinema fan community. Figure 5: Further examples of inter-subjective fan conflict. As participatory cinema practices have already taught us, even the most dedicated and knowing fans need guidance. 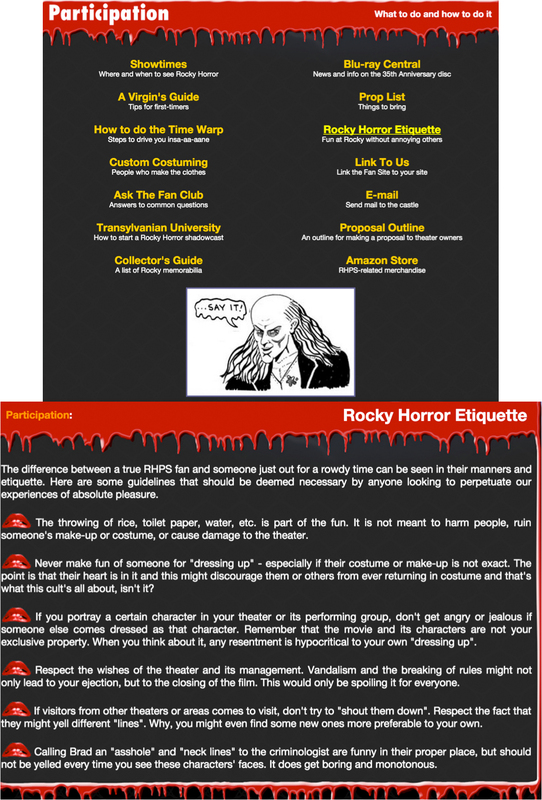 Indeed, in Figure 6 we see the precisely timed instructions and the specific prop list provided online for any potential participants of the Rocky Horror Picture Show (Jim Sharman, UK/USA, 1975), which, given that it has been requiring audience interaction for around 40 years, might be forgiven for assuming at least some audience awareness of required behaviours. Although there were already these existing fan communities for Back to the Future, this was the first occasion in which they could – and indeed were required to – interact with the story world in this way. Conflict for control manifested itself once more when one adept fan put an FAQ together to support the participants. This received an immediate and very positive response in the form of 7,000 hits on the first day. Indeed, the FAQ was a model of clarity, revealing nothing that would undermine the overall engagement with the event and which was clearly produced out of a profound love for both the Secret Cinema experience and Back to the Future. 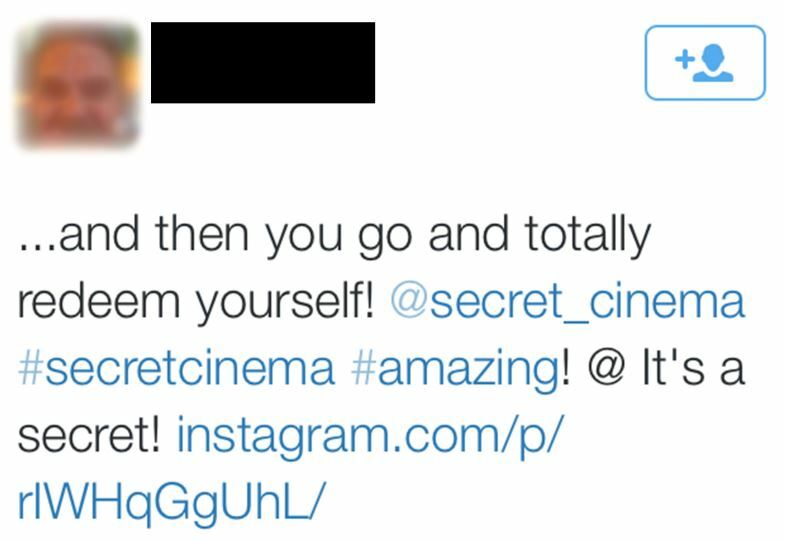 However, Secret Cinema requested that it immediately be taken down with the assertion that it was “confusing the audience”. In this way, Secret Cinema appeared at this point to be adopting what Jenkins describes as the “prohibitionist” stance. The Secret Cinema response also demonstrated a further contradictory position in relation to the fans’ level of participation/engagement, since it was clearly at odds with their earlier invitations to contribute (by submitting stories, voice messages, shopping in the pop-up store, preparing costumes and buying props for the event). It would seem that the organisation was attempting to own and to control a social space that was set up specifically for fans to engage with in advance of attending the event itself. This fannish productivity, an attempt to ease understanding and to provide translation across participant subjectivities, was discredited by Secret Cinema as they tried to secure and maintain control. A perfect storm of confused communication had been created, fueling the swathe of fan/audience responses that followed at the point of the final breakdown in communication relations. The event hit delays and the launch and the opening night of the show were cancelled, with audience members (who had left their mobile devices behind as per instructions) being given just 60 minutes notice. As we discuss below, the backlash to these delays and cancellations was considerable. In a vehement response, the audience quickly began to manipulate and re-appropriate the Back to the Future text as a mechanism through which to critique the producers, clearly highlighting that Secret Cinema were not really the authors of Back to the Future, being instead appropriators and adaptors of the original text. 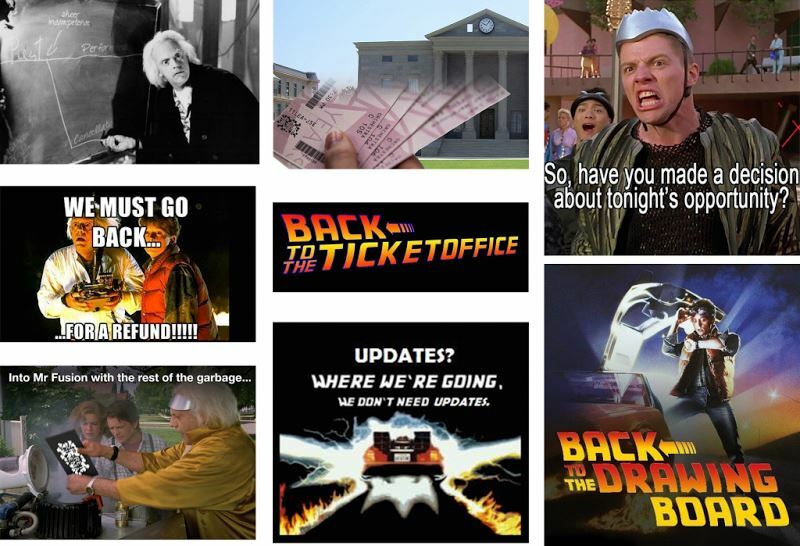 Initially this re-appropriation of Back to the Future by the event participants was done through the use of text-based tweets and Facebook posts that, as with the previous crashing of the website, incorporated famous lines from the film interwoven with complaints and vitriol (see Figure 7). The resulting text playfully reworked the original meaning of lines from the Back to the Future script to create an unintentionally synchronized, crowd-sourced, alternative storyline of the ‘Secret Cinema Cancellation Debacle’. In this way, the audience voice now became prominent in the social media realm as participants enacted critical and cultural production practices. This new storyline was also serialized in the mainstream news as we describe below. Figure 7: Illustrative examples of fans’ text-based manipulation. This criticism can still be described as a potentially pleasurable form of engagement – a mechanism through which to express anger and frustration at Secret Cinema – but it also provided an opportunity to flex and display subcultural prowess. We see fans engage in these practices whenever a remake or adaptation of a well-loved text is attempted. We can observe this at the start of Peter Jackson’s adaptation of the Lord of the Rings trilogy; it has also been true of game to film and book to film adaptations/translations such as Silent Hill and the Harry Potter series. Indeed, these Back to the Future fans were displaying what we referred to above as their virtuoso command of this text/story world, as well as their technical competence and cultural capital (or technicity). Figure 8: Illustrative narrative-based re-appropriation. This textual manipulation and re-appropriation quickly advanced to the practice of visually manipulating still imagery taken from the Back to the Future film. The initial spark for this new vein of activity seemed to be the appearance of a controversial image showing the unfinished set of the event on the opening night. This was quickly taken and re-contextualised within the text of Back to the Future. 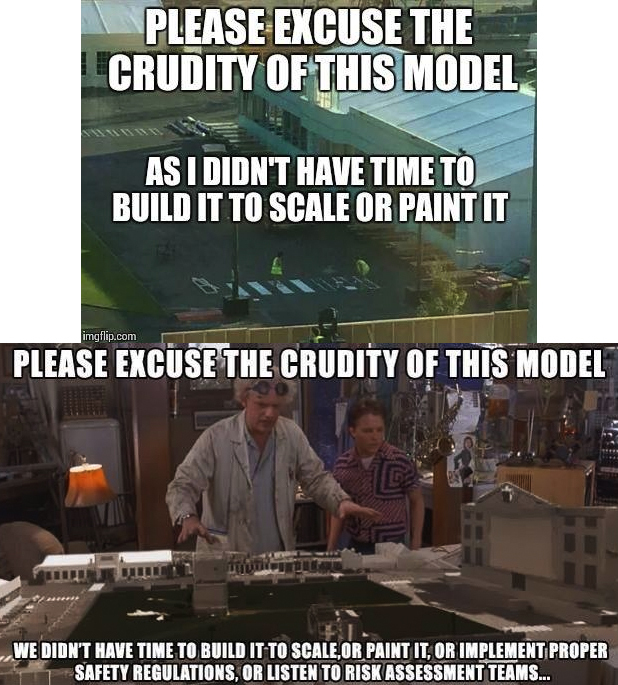 One such example repurposes Doc Brown’s line ‘Please Excuse the Crudity of this Model’ taken from the scene where he has built a model of Hill Valley to demonstrate the lightning capture process placed over the image of the unfinished Secret Cinema set (see Figure 8). This was then followed by a rapid succession of newly manipulated images. As Jonathan Gray has observed, “[f]ans live with in-built, intricately detailed memories of their text(s)” and so these responses, demonstrating the audience’s affective involvement and investment in the Back to the Future text, came thick and fast (see Figure 9). Figure 9: Illustrative examples of fan image-based manipulations. Many of these images were taken and reproduced in blogs that documented the seeming demise of Secret Cinema, as well as being printed in mainstream press as the cancellation made national headline news. This is perhaps the ultimate desired destination for the handiwork of a textual re-appropriator: to gain widespread recognition, kudos and cult status. Perversely these emergent critical paratexts, which could be seen not so much as flame-bait but as flame-fodder, actually diffused the situation, providing moments of humour and a release of tension for the communities affected by the cancellation. Figure 10: Participants display dark humour in response to the cancellations. The comment shown in Figure 10 hints at a darker side in which viewing pleasure is derived from looking on at a serialised disaster; this impromptu fan-driven storyline around the cancellation has thus become a media spectacle in its own right, a perspective that then found support through mainstream media coverage, which in turn helped to escalate the visibility of the ‘Secret Cinema Cancellation Debacle’. This mainstreaming and high visibility of the cancellation storyline then provided others with the mechanism to caution for a sense of proportion. The high profile coverage prompted a critique of the banality of the Secret Cinema backlash, as this cancellation trended on Twitter alongside bigger news stories such as the Gaza conflict (see Figure 11) with the story receiving a high ranking on mainstream news agendas. Figure 11: News hierarchy showing Secret Cinema debacle achieving a prominent position alongside serious world events. In this backlash, we see manifestations of anti-fan critique, the anti-fan being a useful mechanism with which to reverse the lens of fan studies in order to consider other equally intense relationships to content, as Jonathan Gray and Cornel Sandvoss have argued. That is, in order to fully understand what it means to interact with texts we must also examine anti-fans. With regard to the string of events surrounding the cancelled Back to the Future screening, the anti-fan discourse emerged at several places on a spectrum ranging from outward displays of hatred, anger and vitriol to mild critique and poking fun (see Figure 12). With regard to the former Fabien Riggall, the event’s organizer and the founder of Secret Cinema, was presented especially as emblematic of a hipster cultural elite. Furthermore, in this instance he was held up as a folk-devil figure and was ridiculed as a “trustafarian”, what the Urban Dictionary describes as “a rich young person who adopts an ethnic lifestyle and lives in a non-affluent urban area”. Kimberly Springer defines such hatred as “hateration” – as an anti-fan activity distinguishing anti-fandom and hatred from “trolling, flaming, and other undesirable web-based behaviors”. Meanwhile, at the other end of the spectrum anti-fans critiqued Secret Cinema–goers as middle class, and part of a cultural elite, and poked fun at the hundreds of lost, costumed participants and their indistinction from hipster Hoxtonites (residents of London’s Hoxton area) in general. At the event, each audience member is getting their own unique character and story, so they’re written into the script. It’s turning out to be a pretty intense summer. But you can’t do Back to the Future and not aim high. We’ve been infected by the spirit of the movie: this strange, innocent optimism. Which is dangerous, because it means we think that we can do anything… I’m shitting myself because this film is so well-loved, so if we mess up anything we’re in trouble! A deliciously prescient comment. At the outset it was clear that as a producer-fan Riggall well understood some of the risks that lay ahead in adapting this particular text. As an aside, we also saw some intriguing behaviour that we describe as ‘dark marketing’ – the specific practice whereby trending metadata related to an unfortunate incident, accident or disaster is reframed and exploited for commercial imperatives. So in this example these ‘dark marketeers’ were able to capitalize upon the Secret Cinema cancellations to reap very specific rewards in relation to their own profile, publicity and new participants. As shown in Figure 13, Crate Brewery, Rufus Hound and Madame Tussaud’s all offered, inter alia, discounted entry rates and/or free beer to those suffering through the cancellations. This was a canny use of a high trending fan/creator debacle being played out in the highly visible spaces of Twitter and Facebook. But, crucially, there was of course the widely understood happy ending in terms of both audience satisfaction and commercial success. Fans across the spectrum swiftly asserted their pleasures post-event (see Figure 14). The fan-authored storyline and the spectacle of the ‘Secret Cinema Cancellation Debacle’ had a satisfying and conventional happy ending. Figure 13: Incidences of these “dark marketing” practices. Figure 14: Delighted audience feedback. Earlier we mentioned what Andrea Phillips describes as the errors attendant to a “badly drawn play space”. What we have examined here is the battle for agency and authority that can play out between audience and producer when the communication strategy is inadequate to the complexity of the engagement afforded. The lack of clarity and distinction between channels was the fissure that allowed the adoption of a critical stance on the part of the participants in Secret Cinema Presents… Back to the Future. It also became the site of contestation that demonstrated that this is a space where fans (and anti-fans) can swiftly overtake and dominate through virtuoso technicities. 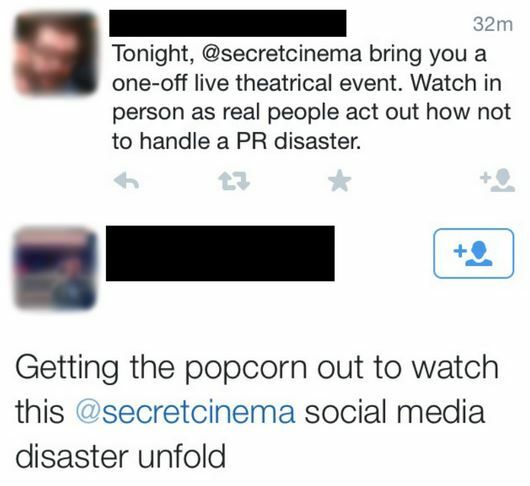 Secret Cinema believed their audiences loved them enough to go with the sprinkling of information and inconsistencies. But critically their audience comprised of more than their devoted, tolerant and adept Secret Cinema cognoscenti, but also more unruly and demanding Back to the Future fans with passions not strictly aligned with Secret Cinema. In this year’s Secret Cinema experience – The Empire Strikes Back – we see that the organisers have learned the lessons from the debacle described above. This time the ‘secret’ aspect became critical to what we could describe as the ‘digital scenography’. Within the social media mise-en-scène, secrecy became a fundamental aspect to the interpellation of the audience and intrinsic to the pre-event experience. Instead of resisting the covert approaches taken in other events (creating problems such as those identified above) the audience could now readily engage in the ‘stay disconnected’ narrative, performing in-character on social media. Core to this secrecy was an additional invitation to be part of an underground rebellion. The overlapping nature of the narrative architecture and the apparatus used to engage the participants produced a unique convergence of aesthetics, which captured a particular mood in the post-election malaise of May 2015. Taking the story underground and offline to secret rave-like spaces (there were a number of pre-event pop-up night clubs as well as the Secret Cantina, which was open for the duration of the official event in a secret location in London) and engaging the audience through a rhetoric of rebellion seems to have taken exquisite advantage of this dominant mood in the run-up to the actual launch. This convergence eliminated the moments of disharmony and discord amongst the participants and signaled the ability of Secret Cinema to continue to adapt this novel format in relation to fan practices and resistances. Sarah Atkinson, Beyond the Screen: Emerging Cinema and Engaging Audiences (New York: Bloomsbury, 2014), 47. These were the Town Hall, Otis Peabody’s Farm, Texaco Garage, Ask Mr. Foster Travel Service, JD Armstrong Realty, Hill Valley Telegraph, Elite Barbers, Hill Valley TV and Wireless, Ruth’s Frock Shop, Hill Valley Broadcasting, Broadway Florists, Hill Valley Stationers, Sherwin Williams Paints, Hal’s Bikes, Roy’s Comics, Roy’s Records, Hill Valley High School, Bank of America and Lou’s Café. Henry Jenkins, “Prohibitionists and Collaborationists: Two Approaches to Participatory Culture” [online] http://henryjenkins.org/2006/07/prohibitionists_and_collaborat.html, July 19, 2006. Jon Dovey, & Helen W. Kennedy, (2006) `Playing the Ring: Intermediality & Ludic Narratives in the Lord of the Rings Games’ in Ernest Mathijs ed., The Lord of the Rings: Popular Culture in Global Context Wallflower: Columbia University Press. p.254 – 270. Henry Jenkins, (2006) “Prohibitionists and Collaborationists: Two Approaches to Participatory Culture” [online] http://henryjenkins.org/2006/07/prohibitionists_and_collaborat.html, July 19, 2006. Jonathan Gray, “New Audiences, New Textualities: Anti-Fans and Non-Fans.” SAGE 6.1: (2003): 67. Cornell Sandvoss, (2005). Fans: The mirror of consump­tion. Cambridge, UK: Polity Press. Kimberly Springer, “Beyond the H8R: Theorizing the Anti-Fan.” The Phoenix Papers, Vol.1, No.2. Ed. J. Holder Bennet. Denton: FANS Association, 2013: 55-77. Andrea Phillips, Hoax or Transmedia? The Ethics of Pervasive Fiction (Austin, TX:SWSX, 13 March 2011). Sarah Atkinson and Helen Kennedy are undertaking the first piece of national industry research on the Live Cinema sector with Live Cinema UK, funded by Arts Council England Grants. This collaboration marks the latest project from Atkinson and Kennedy, who are leading research into live, event and expanded cinema experiences and audiences. Their recent research into Secret Cinema has been published in the G|A|M|E Journal and presented at the Society for Cinema and Media Studies (SCMS) conference in Montreal. They are currently editing the first special issue journal of its kind dedicated to live/event cinema. Atkinson, Sarah and Kennedy, Helen W. ‘Tell no one: Cinema as game-space – Audience participation, performance and play’, G|A|M|E: The Italian Journal of Game Studies, Number 5 (2015). Potton, Ed ‘Film Spy: Why Secret Cinema’s Shawshank Ups the Ante for Immersive Film-Going’, The Times, 3 December 2012.